In 1996, ShoreTel's founder declared: "There's got to be a better way." After years of leading teams at high tech companies, he was confounded by the inefficiency of his office phone system and the complexity of replacing it with a new system. He saw how IP networking could replace traditional TDM voice switching and applied his deep understanding of distributed computing to a new vision: a streamlined alternative to the bloated, complex, resource-heavy IP business phone systems being marketed by legacy PBX and digital networking companies. The result? A fundamentally different and brilliantly simple approach to system architecture that is resource friendly, scales easily and distributes call control across an array of solid-state phone appliances. Popular with companies that value solid phone system performance and substantial bottom-line benefits, ShoreTel has grown into the world's leading provider of Brilliantly Simple IP communications solutions. 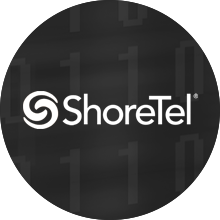 Since that original innovation nearly 20 years ago, ShoreTel has once again re-invented a better way to communicate and collaborate in business with ShoreTel Connect -- our common platform based on a single software code. Now one platform and user interface delivers business communications from the cloud, onsite or a hybrid combination. Now, whether you prefer to subscribe to a managed cloud service, invest in an onsite system, or deploy a combination of the two, there is a single UC solution that delivers the same outstanding features and user experience to the entire team.